From 2017 onwards Employee State Insurance Corporation has stopped issuing new Pehchan cards to the ESIC members. Earlier ESIC used to issue 2 magnetic striped Yellow colour ESIC cards to the ESIC members. But at present, ESIC is not issuing ESI cards to the employees. In place of old ESIC cards now ESIC members need to use E Pehchan card, which is also known as a counterfoil. Employees whose monthly gross salary is below 21000 Rs are eligible for ESIC Pehchan card. Even family members who don’t have any income source and minor children, spouse and parents are also eligible for ESIC benefits. The employer needs to collect all the required information of employee during the joining date of the employee. Only employer can able to download the ESIC E Pehchan cards of employees in their employer ESIC portal. Here is a step by step process on how to download ESIC Pehchan card. Step 1: To download ESIC E Pehchan card login to employer ESIC portal with establishment ESIC code and password. Step 2: Now in the home page there is an option called e-Pehchan card under employee section, now click on e-pehchan card option. Step 3: Now a new page will open there enter the IP number of the insured person and click on view. Step 4: Now details of the insured person will appear on screen like the name of the IP, date of registration in ESIC and gender. On right hand side, there is an option called view counter foil now click on that. 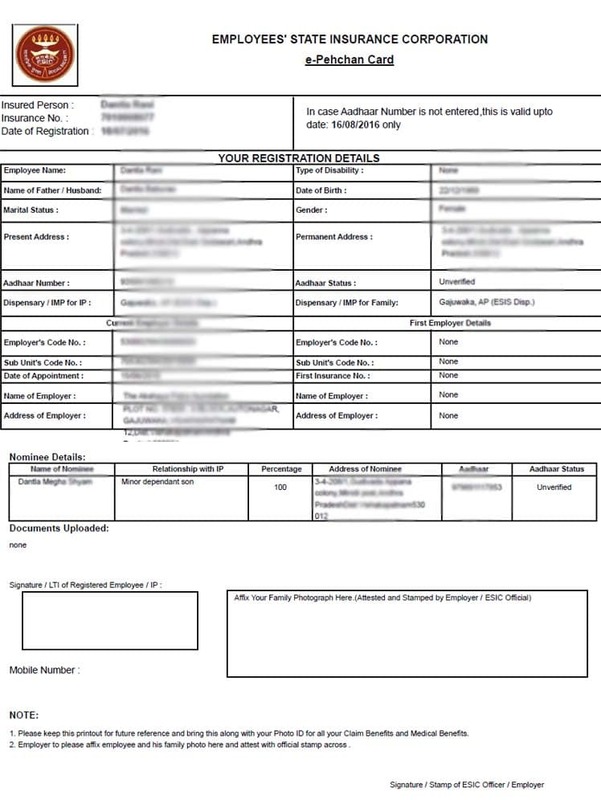 Step 5: Now the E Pehchan card of the employee will open, now check whether all the details like nominee details, family members details and dispensary details are present or not. If they are not present then update those details and take out the print out of E Pehchan card. Step 6: Now sign on this ESIC card and affix your family photograph and attest the photograph with your employer and finally take the signature of ESIC officer. Employer can update family members details whenever the insured person marries somebody and when new family members add to their family. To update family details in ESIC card again ask your employer to update their details. To update your family members details your employer will log in to their employer ESIC portal and there update option is available, once details are updated then again take out the print out of the e-Pehchan card. Editing or correcting E Pehchan card is very easy, except some details like name and date of birth of insured person remaining details can be edited by the employer. Whenever the address of the employee changes or whenever an insured person wants to change ESIC dispensary can ask their employer to edit those details. Once they edit those details then again takeout the new print out. Until employer doesn’t mention the exit date in their employer ESIC portal till then ESIC Pehchan card is valid. But remember the ESIC contribution period is divided into Two parts, one is from 1 April to 30 September and another one is from 1 October to 31 March. So when you left your job in the above mention period then you are eligible for ESIC medical treatment until completion of that particular Six months ESIC contribution period. Only your employer can download your ESIC card. I think you have lost your ESIC Pehchan card, you can get a duplicate ESIC card by submitting duplicate Pehchan card request letter at your regional ESIC office. To use your previous ESIC number just give that number to your new employer and tell them to make ESIC payments to that number. It is your right to get your ESIC number. If they are really paying ESI then they have to give your ESI number otherwise register a complaint in your regional ESIC office. I am currently working in a private company. Previously I have worked on ve one company… during that time they provided a permanent ESIC card but while joining the new company I forgot to give the ESI details…so now they created new IP number and paying contribution to that number.. last one year contribution they paid to that number….now I am working at Bangalore.. previous company in Chennai…how to transfer my contribution details to old? Or how to take treatment in new IP.. please give a advice. i am gagan kumar das, my id no is 1814723417. how to get e pahchan card? please send link so that i take print out for treatment. i am suffering dental problems last 1 year. i lost some teeth due to illness. my dispensary is Bhelupur, Varanasi (UP). here not dental doctor, so please give me list of dental hospital,varanasi under ESCI. now i treatment in private dental hospital due no guide and no help anyone. You should take a temporary ESIC card from your employer and visit your ESIC office along with your family members for the photograph. Then within in 30days, you will get your Pehchan card from them. In the meanwhile you have to visit your ESIC dispensary with a copy of temporary id card then they will guide you on where to get your teeth treatment. Can I avail medical benefits / treatment to my nearest hospital/dispensary through E-Pehchaan Card issued to me by employer ? You can get treatment under which ESIC dispensary you are registered by your employer. I am employer and one of my employee is registered under ESIC . I have to issue him ESIC Pehchaan card . So I want to know how to issue that. You have to give him ESIC temporary ID card (print counter foil)which you can get in ESIC employer portal under employee section. Attest that print counterfoil and tell your employee to visit their ESIC office along with his family members to take a photograph, after 30days he has to collect his ESI pehchan card from ESIC office. I am not able to update my father’s aadhar details and its showing its already connected to a different Ip address, what to do now, please help? Maybe any of your other family members have included him in their ESIC card, so please check. Otherwise, you can contact your regional ESIC office to update your father’s details. Hi Rajesh, i am the only son and this is the first time applying for ESIC and went to branch office they told me to contact Employer and they told me to contact again ESIC branch office, please help! It is the responsibility of your employer to generate ESI number to you. Only for taking ESI Pehchan card you need to visit ESIC office, but before that, you have to take temporary ESIC card from your employer. Recently I have contact my Hr office for e- pehchan card. Take ESIC temporary id card (print counterfoil) from your employer and submit it to your regional ESIC office. Recently I have contact my hr office for pehchan card but they replied that now a days aadhar card itself declared as pehchan card and give me only my IP number. Should I get the benefits of esic or not?? Yes, they are correct. your Aadhaar card will be enough to get all the ESIC benefits.But please make sure all your family member details are added to ESIC portal.